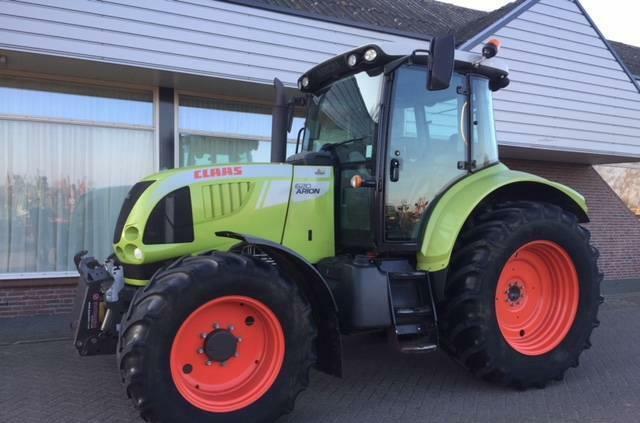 The detailed specification of CLAAS Arion wheel tractor is provided below. The details on engine output, gearbox and emission class are as follows: engine cylinders: 6, 135 hp, transmission: hexashift powershift. Chassis configuration: front tires: 480/65x28, rear tires: 600/65x38, tires: goodyear. Cab design: cab air suspension, air conditioner. The vehicle is located in Niederlande, Netherlands.